Marianne Meins is vice president of critical infrastructure protection strategy at Parsons, where she has worked for the past three years. With more than 25 years’ experience working with cybersecurity research and development, Meins has held leadership positions at numerous technology companies. At Parsons, she is involved in infrastructure protection, including sectors such as energy, transportation, health and government facilities. She spearheads the company’s converged security offering by providing an innovative framework for securing control systems, including the innovations that span them all — namely smart cities and intelligent transportation systems. Meins is active in the local community and serves as a CIP adviser to Capitol Technology University and on the executive advisory board of George Mason University’s Computer Game Design Program and the Virginia Serious Game Institute. In addition, she is an active thought leader in discussions around STEM education and infrastructure protection. Why watch: Meins’ more than two-decades-long passion for protecting critical infrastructure places her in a prime position to provide leadership now that cybersecurity is a must-have for government and commercial enterprises. Meins is on the cutting edge of American industry’s response to the demand for technology-based solutions to evolving infrastructure threats. Parsons’ recent survey of ICS and operational technology engineers within U.S. critical infrastructure facilities revealed a lack of integration of OT and IT professionals within the organizations and models for assuring resilience to cyberattacks that do not reflect a fully converged OT/IT approach. Thanks to Meins and Parsons’ federal team’s work, the company will soon roll out its CIP product. And over the next year, Meins expects to realize the benefits of the product rollout, as well as Parsons’ recent acquisition of cybersecurity and national security focused firm Polaris Alpha. Prior to acquiring Polaris Alpha, Parsons acquired Williams Electric Co., which has become integrated into Parsons’ holistic approach to security. 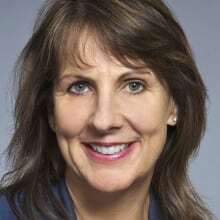 “We have substantial expertise in infrastructure engineering through our design/build/protect role with clients and across the company we have so many technology-driven opportunities to provide Critical Infrastructure Protection: defending against physical and cyber threats while ensuring safety, reliability and resiliency,” she said. Meins will continue to play a key role in the CIP domain as government leaders emphasize the need to strengthen U.S. critical infrastructure security and resilience posture.